It was from Dr. Mary Stauffer, who, at 96 years old, had joined a social platform primarily used by job-seekers, recruiters, and those looking to advance professionally. That tells you a lot about Dr. Stauffer, a slight woman with a wry smile, whose unquenchable thirst for knowledge is surpassed only by a thirst for enriching her beloved Downey community. And while today most of us view Dr. Stauffer as a sweet, gentle old lady, it’s an incomplete description that doesn’t adequately capture her life’s work. Dr. Stauffer was a medical pioneer of sorts, obtaining her medical license at a time when few women were welcomed into the medical field. After graduating from the Ohio State University College of Medicine in 1943, she was denied entry into India, where she had dreamed of helping impoverished children ever since she was a child herself. India’s loss was eventually Downey’s gain. In a recent interview conducted inside her modest Orange Estates home, Dr. Stauffer recalled how she and her late husband, Floyd, a national diving champion, met in medical school and fell in love. They married in 1943, the same year she became a physician. The couple moved to Montebello to start their life together. Even back then Downey was a step-up community. They moved into a new track house on Via Amorita and later into a spacious, custom-built home on the 7200 block of Rio Flora Place, abutting the Rio Hondo Golf Course. In a twist of fate, another Downey civic leader, Councilman Rick Rodriguez, lives in the same house today. Dr. Stauffer’s first medical clinic was a brick two-story office building at La Reina Avenue and 2nd Street in downtown Downey. She later moved to Gallatin Medical Center at Paramount Boulevard and 5th Street, and then finally into the medical offices on Brookshire Avenue, across from Downey Community Hospital, as it was known then. To hear Dr. Stauffer tell it, her foray into community service happened naturally, sort of like a boulder rolling down a hill. First, in response to rising gang violence in Los Angeles and its surrounding suburbs in the late 1980s, Dr. Stauffer joined the organizing committee that created Gangs Out of Downey. Then she joined the Downey Sister Cities Association, helping to strengthen the bond between Downey and Mexico. After that, she joined the Christian Business Women’s Association. “And then one day I went to a Downey Christian Men’s Association meeting,” she shrugged. Dr. Stauffer retired from medicine in 1993, three months shy of her 80th birthday. She downsized into her current home, where plaques, scrolls and framed certificates dating back several decades adorn the walls. Valentin Flores, the former executive director of Stay Gallery, said the art space may not have been possible without Dr. Stauffer. “When we were building the gallery [in 2012], we were obviously fundraising and reaching out to everyone for help,” Flores recalled. “When we reached out to Mary, she was very upfront and told us that she didn’t really care for the arts. There was a bad track record in Downey and the whole scandal with the museum, but she really liked us. She really liked what we were trying to do. When he was on the City Council, former mayor Mario Guerra brainstormed an idea for a “Downey Hall of Fame” outside City Hall, with Dr. Stauffer as the inaugural inductee. The idea was approved by the council, though for budgetary reasons it failed to gain traction after Guerra left office. “To this day she is the first and only inductee in the City of Downey Hall of Fame,” said Guerra. It’s estimated that Dr. Stauffer has gifted more than $5 million through educational grants and scholarships in the last 25 years, though the actual total is likely higher. 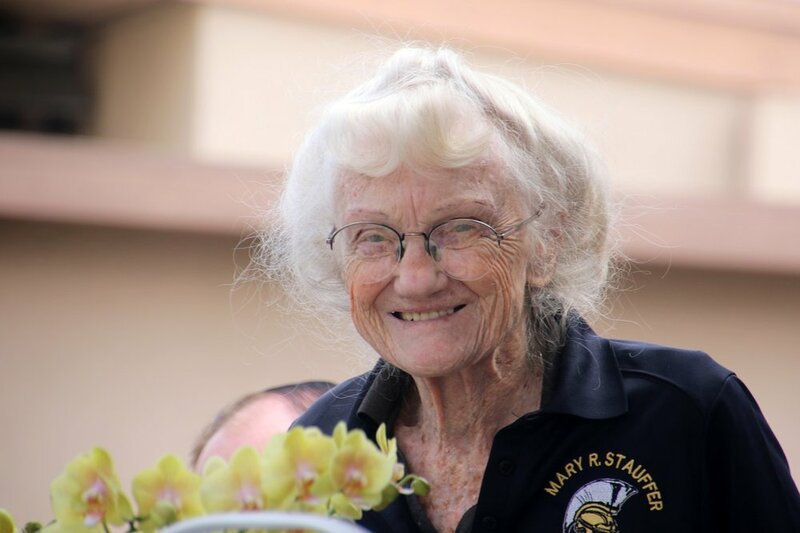 Her foundation – the Mary R. Stauffer Foundation – bestows $2,500 scholarships to 50 graduating seniors from Downey and Warren high schools each year, plus “monetary awards” worth at least $100 to approximately 800 students per year. “Students are a good place to invest,” said Dr. Stauffer. “I live here; it makes for an educated, pleasant community to live in. I’ve enjoyed living in Downey and hope to continue. One such opportunity came about five or six years ago when an Apollo space capsule was in danger of being scrapped due to unpaid storage fees. Dr. Stauffer paid the storage fees -- $2,000 – and donated the capsule to the Columbia Memorial Space Center. She later celebrated her 95th birthday at the center, literally under the stars. “Dr. Stauffer’s community involvement and willingness to help others has cemented her legacy in Downey’s DNA,” said Mayor Fernando Vasquez.